Yes. Click HERE to visit the US Department of State and read the FAQ's on the subject. Yes, you’re not in good hands with your insurance company once you cross the border. 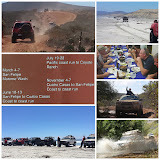 We recommend Baja Bound Insurance they have handled insurance for the Baja racers for the past 20 years. You can purchase a policy for just the days you are in Mexico for about $15.00 a day. You can buy online or the morning of the trip. This is our meeting place so there is no excuse for not getting insurance. Do cell phones work down there? Almost. Like everything and everyone else in Baja, they work some of the time. AT&T works the best for us. They have a new plan as of this writing that encompasses like 600 minutes for 60 bucks. They even have a text message plan that is around 20 bucks for 100 text messages. *UPDATE* AS of 11/2016 our AT&T plan is a no roaming to Mexico plan. FINALLY!!! This tour is all inclusive with the exception of fuel and souvenirs. You know your rigs fuel economy. On the standard tour, we travel approximately 400 miles in country. Actual mileage will be given to you in a trip package emailed to you with your confirmation. Figure $120.00 per day for fuel and trinkets in the local stores. Don’t forget a few extra bucks to buy something nice for your sweetie back home. It is always advisable to have a few hundred in cash stashed away separately just for emergencies. How much highway driving will there be? Figure a couple hundred miles. We will travel in a group during the daylight hours only. We have a lead vehicle and a chase vehicle both in radio communication. We provide complimentary cervesas at the end of each day. We advise you to pick up anything special you may want. We will gladly stop on the way so you can pick up these supplies. Nothing better than sitting around a campfire after a long day on the trail, enjoying a few cold beers with your buddies bench racing the night away. We encourage this in a responsible manner. I hear Mexico is dangerous? There has been a lot of bad publicity about Mexico, and some of it is true. Thankfully, most of the violence happens in other locations and the "narcos" have more important things to do than worry about a few gringos in 4x4’s. 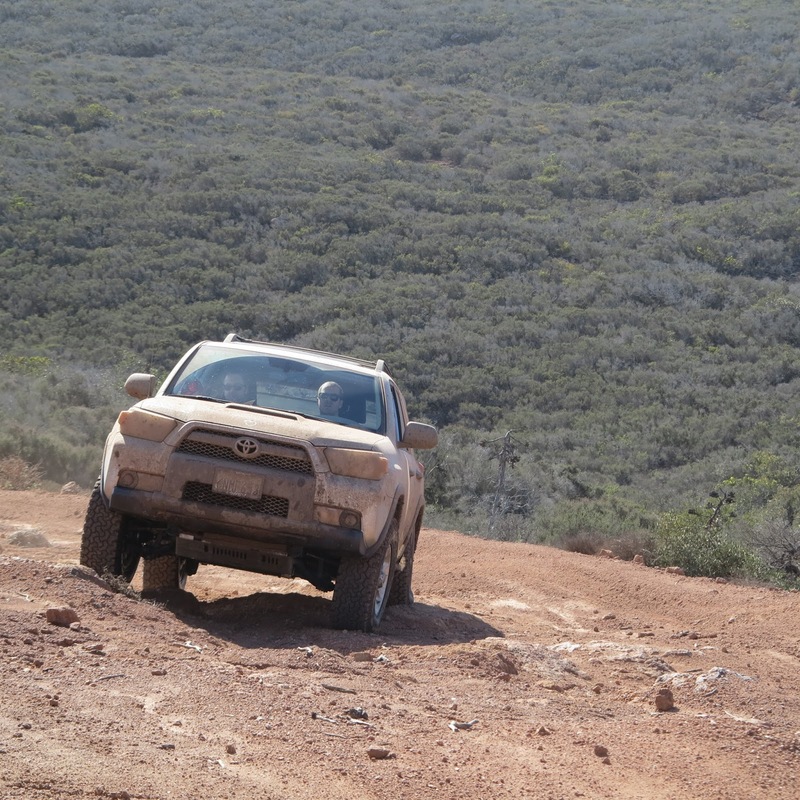 With the right attitude and situational awareness, traveling in Baja, especially on a dirt trail can be fun and reasonably safe. We have been traveling through this country for over 25 years. We know the way things work. That’s why you hire us as guides. The Mexican people are some of the most gracious and wonderful people found anywhere. Respect goes a long way. Most any of the people there are always willing to lend a hand to you, offer a friendly handshake and a wave. Treat the locals with respect and you might just make a lifelong friend. GUNS AND AMMO ARE FOBIDDEN IN MEXICO PERIOD! DO NOT BRING ANY FIRARMS OR AMMO!!!! IF YOU ARE CAUGHT IN MEXICO WITH ANY TYPE OF FIREARMS OR AMMO YOU WILL BE SWIFTLY ARRESTED AND WILL BE SENT TO JAIL. I hear there are military checkpoints? Military check points are a way of life in many countries, and Mexico is no exception. We’ve always been nice to the Federales and treated them with respect. Just like our boys doing roadblocks in Iraq, they are mostly young, bored and in the middle of nowhere when they would rather be on vacation like us. They love stickers and sometimes will take a break and pose for pictures or trade souvenirs. If you have stickers, hats or patches from your club, shop, or military unit the guys will usually figure out something to trade if their LT isn’t looking. Keep your hands in the open and your tone friendly and they will treat you fine. 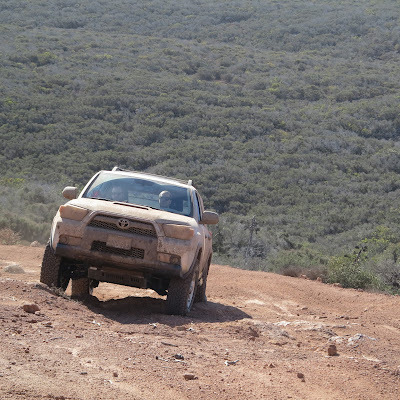 In over twenty-five years of traveling Baja roads, we’ve never had a single bad incident with a Federale. Cops, yes, the army, no. As for cops, if you get pulled over for some violation, real or manufactured, ask politely what you did wrong and then ask if you can pay the ticket directly to the cop in lieu of going to the station. How many rigs are on your normal runs? We feel the perfect size is 6-8 rigs. We like to keep it small to medium sized. If you have a larger group or club we can accommodate we have plenty of guides available. Just let us know and we can work with your group or club. What are your average costs and length of trips? Our basic trips are 4 day 3 nights. We do like to do a longer trip once during the year. You can figure just under 300 per day. That covers all guide fees, accommodations, food, snacks, drinks, and even beer. We can do special pricing for clubs. Just let us know. We work very hard to make this an affordable trip for you. • Water—3 days supply. Filtered water is available at local markets. • Tool kit. You know your rig better than anyone else. Pack your tool kit accordingly. • Spare parts. Radiator hoses, spare plugs, wires, basic stuff you most likely carry when you run trails. • Bedding Sleeping bag pillow etc. • Clothing. Wear layers. It’s usually cool in the mornings and can get very warm towards the afternoon. • Most important….Bring your relaxed attitude and a quest for adventure!